Attracted by the cover and nothing more really, I picked this book up. Not knowing what I was going to get, after having read some rather weaker women’s fiction I was a bit wary with this choice. Within the first couple of pages, all doubts were thrown away as I settled into this wonderful novel. Right from the beginning you are swept up into Mia’s life. Mia is heartbroken, her future was taken away from her when her husband died. She has not moved on in any way apart from doing one thing, buying a run down guest house by the sea and singlehandedly renovating it. Whilst not quite estranged from her family they have taken other paths and routes through life and Mia has now distanced herself from them all. The only family she has is Madeline and Richard, local residents at Butterfly Cove who have taken her under their wing and been helping with the house. That is until Madeline stumbles upon Daniel Fitzwilliam, newly arrived from London and looking for a place to stay. Madeline just knows the prefect guesthouse for him. Trouble is the guesthouse is not finished and Mia is not looking for any guests yet. Daniel is running from something and seems hurt by the actions and decisions he has made. A friendship begins to develop and they both recognise something in each other and slowly a healing process takes place. As relationships heal, move forward so does the renovations on the guest house and it becomes very much a feature of both Mia and Daniel. The future is held within the walls, decorations, colours and the photographs. Whilst you could say it was inevitable what was going to happen, I think the story has a lot more depth to it and a lot of raw emotion and love is contained in the short amount of pages than can be found wanting in some much longer novels. It is this which kept me reading, kept me awake to see the guest house develop, to see Mia grow stronger, to see Daniel forget his past and for everything to come together. All the characters are fully developed and this is what makes it a real strong story. And the best bit of the novel – this is in fact the first in a trilogy. Which means I can go back and visit Butterfly Cove. Thank you to the publisher and netgalley for allowing me the opportunity to read this book. 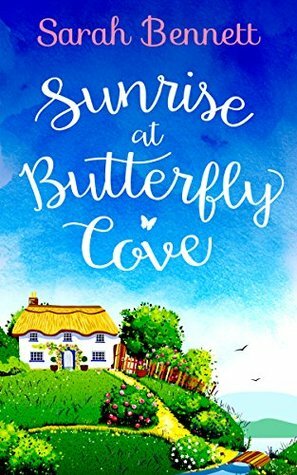 Sunrise at Butterfly Cove is out now.